Ok I was never a huge pancake fan growing up but I did love when my dad would wake up on Saturdays and make my sisters and I cheese logs. They’re huge thin pancakes filled with cheese and rolled into a log then covered in syrup. I liked pancakes more for the memory than for the taste. I was more of a french toast girl. It wasn’t until I began my organic journey a few years back that I began craving pancakes. Sometimes I’d even crave them for dinner. I had to find a way to make them naturally and as whole (do you know what’s in those Aunt Jemima boxes?) as possible. I went to my kind-of-far, local organic grocer BM Organics. I found sprouted spelt and sprouted wheat. I bought a big bag of sprouted spelt and gave pancakes from scratch a try. They were much easier than I thought and they were amazing. I added whatever little extras I wanted and of course topped it with real maple syrup. That’s it! Pancakes became a staple at my house. Luckily my husband didn’t mind eating them for dinner because lots of nights were pancake nights. Actually just the nights I didn’t want a 4 pot orchestra on my stove. 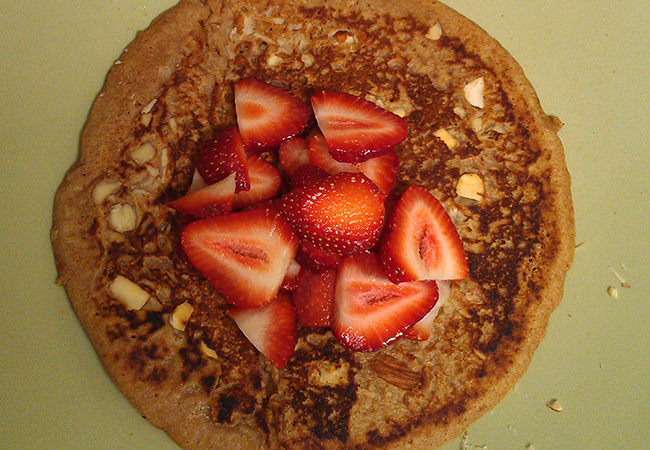 I found Shiloh Farms has a great sprouted flour so I used them and their pancake recipe. The great thing about sprouted flour is that it digests like a vegetable so it doesn’t stay in your belly long if you know what I mean. I attached 2 recipes. The first one is when I wasn’t gluten free for all you wheat lovers (you can change that you know). The second one is for us gluten free folks. Enjoy! Mix the combined liquid ingredients quickly into the combined dry ingredients just until blended. Drop batter in 1/4 cupfuls onto a heated greased griddle. Cook until bottoms are golden and small bubbles start to form on top, 3-4 minutes. Flip and cook until the other side is browned, 1-2 minutes. Serve topped with maple syrup. 4 to 6 servings. But now I’m gluten free so I had to find a way to eat pancakes my way. That was a challenge. Not every gluten free flour works the same way. And not only that, but I can’t have potatoes or eggs. So I had to find alternate ingredients for them. Not an easy task AT ALL!!! 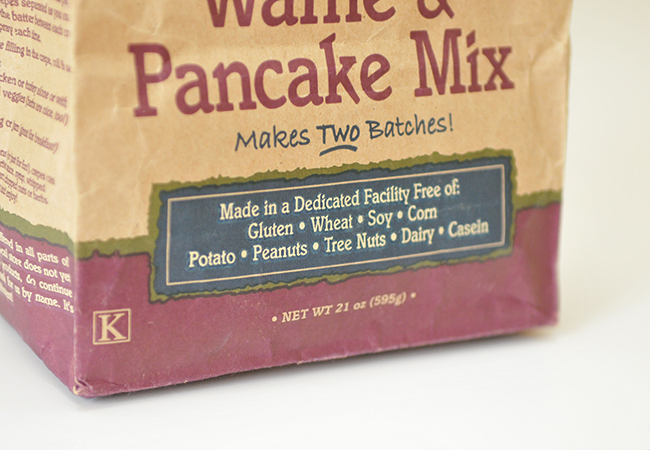 Ok so I tried all of that but those ingredients are not fun to buy and these pancakes are not fun to make so I found a company that just puts everything together sans potato, egg, dairy, corn, peanut, and soy. 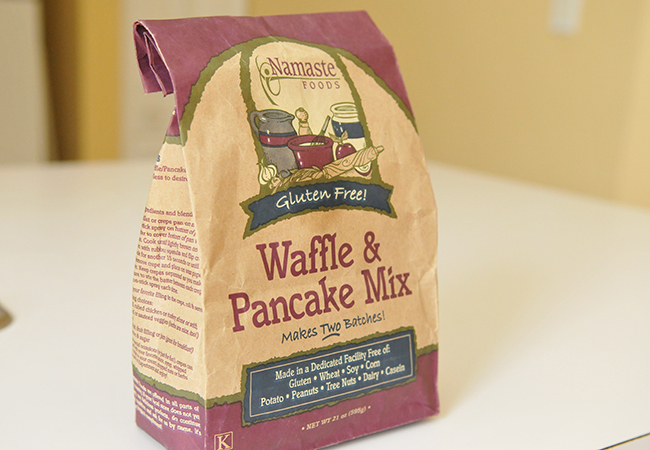 Namaste Foods makes a waffle and pancake mix that is good enough for the craving. It’s very good but the texture is a little off. It’s very sticky. I also tried Arrowhead Mills pancake mix and while it is amazing, it has potato starch so it made my belly swell. 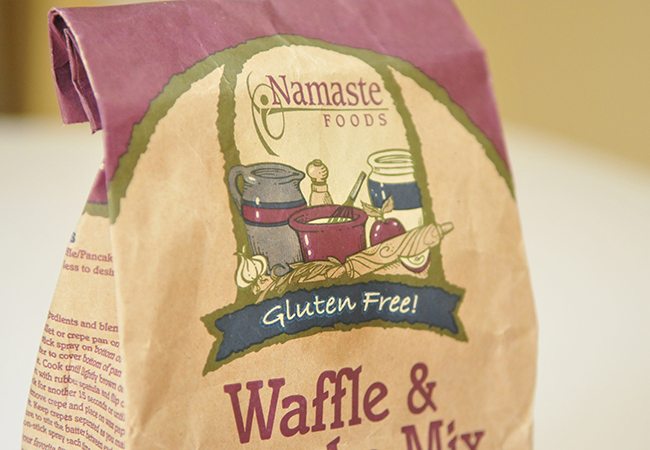 Namaste’s mix is pretty good and doesn’t make me feel sick after. So I’ll stick with it. They sell it in Whole Foods for sure. They also sell it in other nutrition stores. The recipe is on the back of the bag. Just like regular pancakes you just add eggs**, coconut oil and water or almond milk. It’s simple just like I like it. Oh and please stop buying that corn syrup stuff to coat your pancakes. That pancake syrup is garbage. Toss it right now. Don’t give it to anyone you love. Just trash it! Maple syrup is way better tasting and so much better for you. PLEASE do yourself that favor. Look at the ingredients on the back of the syrup you use. What are they?